Mud agitator is popular and simple design solids control equipment. It is widely used in different tank systems, like trip tank, solids control shale shaker tank, suctions tank, storage tank, mixing tank, pill tank. Mud agitator is also be used in liquid mud plant in the drilling fluids tank, water tank and oil tank system. Mud agitator is a based solids control equipment with simple design. 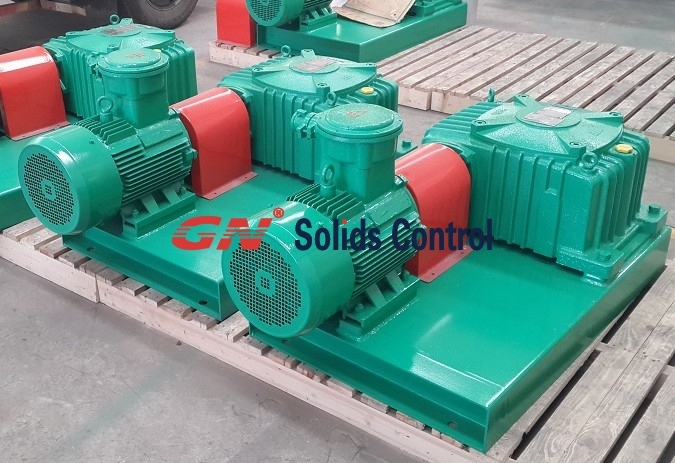 Based on the connection type of driving motor and gearbox, there are 2 different designs of mud agitator. Mud agitator design 1: Direct connection type mud agitator. For this kind of mud agitator, the driven motor and gearbox is connected directly on the tank. It is a compact design with small footprint and less weight. 1) 3-phase Explosion proof driving motor for zone 1 (Class 1 Div. 1) applications. 3) Agitator shaft. The length of the agitator shaft is depends on the tank inner depth. 4) Single lay or double lay impeller suits for the shaft length and tank inner depth. 5) For tanks with inner depth over 1.8 m , shaft stabilizer will be equipped to avoid the agitator shaft from swaying during rotating. Mud agitator design 2: Coupling type mud agitator. For this kind of agitator, the 3-phase motor and gearbox is mounted on a skid and connected through a coupler. Advantage of coupling type mud agitator is that, it is easy to mount on the mud tank system, and easier for maintenance. 1) 3-phase Explosion proof driving motor with coupler for zone 1 (Class 1 Div. 1) applications. 4) Agitator shaft. The length of the agitator shaft is depends on the tank inner depth. 5) Single lay or double lay impeller suits for the shaft length and tank inner depth. 6) For tanks with inner depth over 1.8 m , shaft stabilizer will be equipped to avoid the agitator shaft from swaying during rotating.